For those of us who live it every day, urban life can be unforgiving in its demands. Yet, there are release buttons that can help us slow down and turn towards the natural world and its rhythms. This movement isn’t as much a result of curiosity as it is of a desperate seeking — whether to find the missing pieces of the jigsaw of modern living or to simply let go of the puzzle altogether. 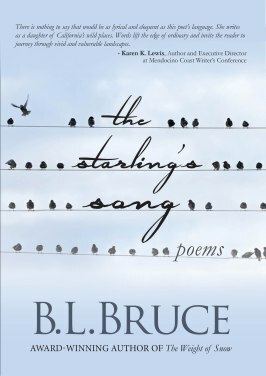 The Starling’s Song, a recent poetry collection, constructs a fine floating bridge to negotiate that distance — between nature’s tranquility and human restiveness. B.L. Bruce makes us walk on that now-steady, now-wobbly bridge with Feel, her very first of the three dozen or so poems in this chapbook. Were you here I’d point out/the coyote’s tracks through the sand,/the distance between where/each paw fell,/tell you he was running. I’d reveal the place/where, beneath the dune grass, the gull’s/body lay torn open and hollowed, say/to you, This, this is how I feel. Bruce’s piercing vision captures and reflects images from the non-human, organic realm with a rare crystal sheen. But this eye isn’t limited to being a camera; by juxtaposing nuances from the world of plants and animals, the poet is able to find clues to anxieties peculiar to the human condition. Mist moves/to the edge of the forest,/catches the last, dusted light, keeps/joining the woodsmoke./ I am waiting/for you, for the sound of you/on the road, on the doorstep. I am bending low/over row after neat row/of red, ripe strawberries. Now, overripe berries/ooze in the August sun./I weigh them, put them/in baskets, and drive home/where I’ll wash them,/boil them, add sugar,/and make jam. None of the poems in The Starling’s Song is too long and brevity certainly seems one of Bruce’s key strengths. The shorter the poem, the more punch it packs. Blood and Seed are two such examples that are able to carry enormous weights on their slender shoulders. Ripe with muscular strength, these poems eschew the need for strong-boned superstructures. What strikes the most about the poems in The Starling’s Song is the rawness of the word imagery. There isn’t a lot of coating going on, nor is there any attempt to ensnare the reader with mysterious metaphors or complex philosophizing. Instead, there’s a refreshing starkness — of both scenes and the longings and aches they echo within the human mind. And yet, even the pain — with all its stabbings– has the ability to redeem a certain kind of peace, as Bruce discovers and relays in Chorus, the penultimate poem in the collection. Even now the arresting silence/in your absence has a music to it.